Nathan Meunier just launched his title This Book Is A Dungeon with us as his publisher! We’re super excited to see the game on Steam and see fans enjoying it already. I sat down with Nathan and asked him a few questions about his game and its unique qualities. Q1: Tell me about yourself! You have a background in writing. How did this translate to you becoming a game developer with a title on Steam? I spent most of the past decade writing about games as a freelancer for major magazines and outlets like Nintendo Power, GamePro, IGN, GameSpot, and more. I’ve also written and self-published eight books to date, so clearly, I’m a bit of a word nerd. While I still write full-time, shifting gears into the game dev side of things has been an interesting transition. Last year, I co-founded a small indie studio, Touchfight Games, and we’re working on a handful of projects, including an upcoming unannounced PS4 and Vita title. But I’m also fascinated with learning new game dev tools, trying bold and unusual experiments, and seeing what kinds of oddities I can create on my own. This Book Is A Dungeon started out as strange game jam-like solo project: to create a creepy interactive fiction game using Twine, document the entire development and creative process in a book, and then launch the two together on Kindle. I’m a non-fiction writer by trade, both with my books and my previous writing, but I’ve always been interested in fiction. The more tinker with it, the more I find that writing fiction within the context of interactivity and gameplay really suits my creative style. So that spun out into a neat experiment that combined my interest in self-publishing and my passion for creating quirky games, but partnering with Black Shell Media has been a great opportunity to bring the game (and book) to Steam to reach more players. 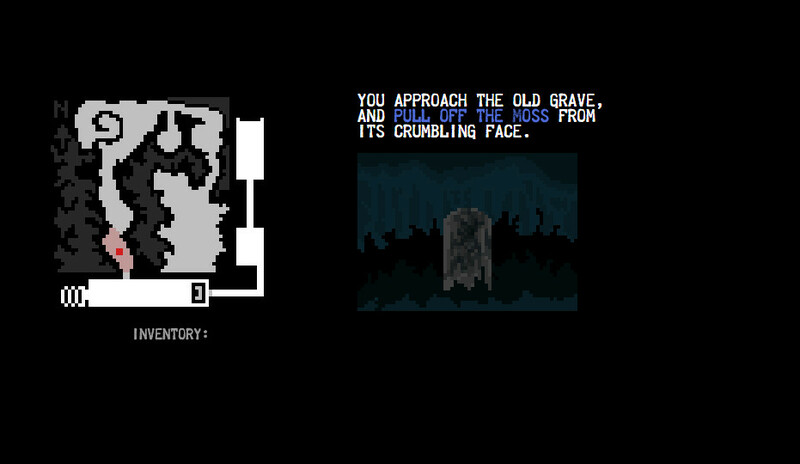 Creating this dark, demented horror dungeon crawler has really ignited my passion for blending words with gameplay, and I’m eager to see where future interactive fiction game projects lead me creatively. Q2: What was the hardest part about creating This Book Is A Dungeon? Setting out to learn a new tool (Twine), conceptualize and build a game, write a book about it all the while, then polish and package both of those things for simultaneous launch involves a LOT of work. Trying to do all of that in the super tight 2-3 month window I gave myself? That was insane. Due to its experimental nature, the idea for TBIAD was to keep development time to a minimum while creating the coolest, weirdest thing I could come up with. Mission accomplished, though the three month cycle was extremely punishing on my mental state. I feel like that probably shines through a bit in some of the creepy, warped aspects woven throughout the game. I’m learning with all of my dev project, that it always takes quite a bit longer than you think to get where you want to go with a given project. Even if you manage to avoid feature creep and keep things constrained, you really have to build in extra time to tackle unanticipated challenges. I feel like I accomplished a lot in the short time I allotted myself, but it was a huge challenge. Q3: What genre(s) would you classify your game as? Why? 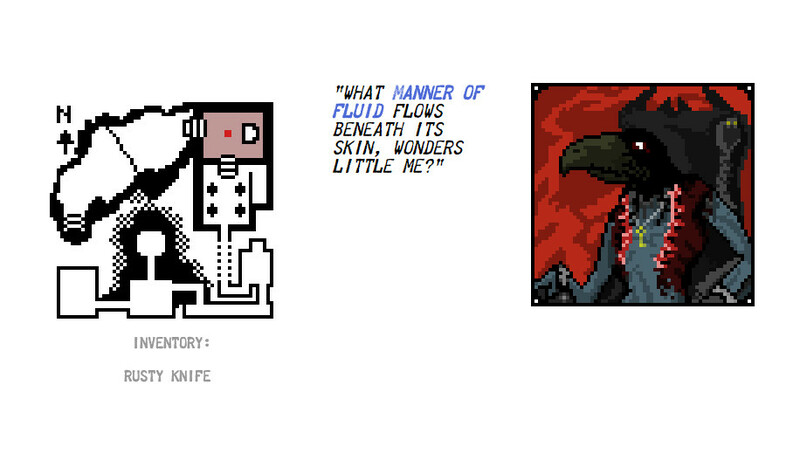 At its core, This Book Is A Dungeon is an interactive fiction horror game, but I wanted to do more with it than throw a wall of text at players, so I put a lot of effort into adding lots of visual elements and additional gameplay beyond the text-heavy nature of things. There are lots of branching paths, horrible ways to die, tricky puzzles, and a lot of secrets you won’t touch on in just a single playthrough. This game will kill you a lot, but I tried to make it worth exploring all the unusual nooks and crannies. I’m also a huge fan of old-school Dungeons & Dragons, so it has a strong dungeon crawler vibe. I wove some light RPG elements, like a basic inventory and health system, a few monster battles, and static map that shows your location in the game world as you progress through different areas of the adventure. Having a dynamic map to give context to where you are in the game world is something a lot of text-heavy interactive fiction games don’t have, and it’s a feature I felt was really important to include — both because it’s something I wanted personally and to give the game broader appeal. Q4: Do you think it’s harder to develop and design a game of non-traditional format like This Book Is A Dungeon? Why? With so many games coming out at a steady pace, trying something a little different can be a good way to stand out in a crowded market. I’m a big fan of oddball indie games, and I especially love games that push boundaries or venture off the beaten path in terms of scope, format, or genre. Building a game and launching it inside a dev diary about the process of building the game is pretty weird. Definitely more than a little meta. It’s exactly the kind of strange experiments I like to try, though there are definite risks that come along with that. I embraced these risks as part of the project, and mentally prepared myself for the chance that my wild idea would quite stick as a hybrid self-publishing / game dev experiment. I set out to try something unusual, have fun, and learn what I could in the process. In hindsight, launching a game on a platform where the vast majority of users are there seeking books was probably a little too curveball. That very conceptual approach did get some momentum and resonate with a select group of people, but I’m excited to be bringing the game to a platform where it’ll get in front of a more gamer-focused audience who will appreciate the more gamey aspects of the project. When I started development, I figured that if the project didn’t quite work as a Kindle release, I could still retool it and launch on gaming platforms. I think if you’re going to try something WAY wild and crazy with your game projects, it’s always good to have a plan B. I designed TBIAD to be dual purpose and to appeal to a few different audiences, so that has helped me pivot as we’ve shifted over to launch the game on Steam and beyond. Q5: How can developers with a unique game like yours overcome these challenges and find success in shipping their title? As I mentioned, have a backup plan can be really useful, but it’s also important to make sure you get a feel for your target audience for a game project, identify who it might resonate with, and try to gauge whether there’s a big enough audience there to justify spending months on a game. There’s certainly creative merit to just trying whatever feels right and seeing if it sticks, but if you want to get paid or get traction for your projects, you really have to think about that side of things too. If you’ve got a cool and unusual game, you can do really well even in a smaller niche, but you also want to make sure you’ve got at least a little broader appeal and an audience who’s interested in that type of project. Beyond that, it’s always good to keep things in scope, tightly constrained, and make a killer small game before going big and crazy with your ideas. You’re more likely to get your games completed and launched that way, and there will be less pressure to knock it out of the park. I could have made TBIAD a HUGE, SPRAWLING thing. But I wanted to create something interesting and unusual while minimizing my risk. Just in case. Always have a plan B, right? Cheers! Follow Nathan on Twitter @NMeunier. Check out This Book Is A Dungeon on Steam!